Roots Rock Racks Up for Women of W.O.R.T.H. The Roots Rock for Women’s Lives concert last weekend was right nice! The 400 Block Bar was loaded with folks who were ready to rock to Atomic Boogie, The Holler, and The Hothouse Peaches. The fun started for me earlier that week on The Northwest Georgia Music Hour as we were joined by The Holler, who put on their first acoustic performance, and good friend Kristen Sheeley representing the Women of W.O.R.T.H. clinic. You can listen to the show anytime on the MullinsMania Radio Archives. 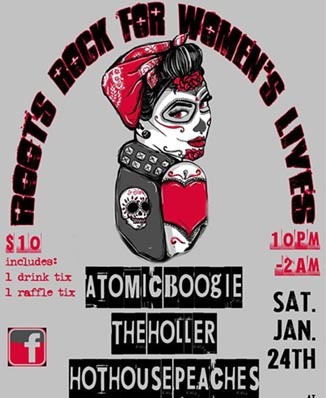 “Thank you to all of you who made our 3rd Annual Roots Rock for Women’s Lives benefit concert on 1/24/15 a success!! Special thanks to Chad Vaillencourt (Atomic Boogie) who stepped up in 2013 to organize the first Roots Rock and has done a spectacular job putting together 3 successful events. Thanks to the Hot House Peaches (who made their Rome debut on Saturday and rocked the house), The Holler and Atomic Boogie for rocking out to support Women of W.O.R.T.H., Inc.! As always, we’d also like to thank La Scala and the 400 Block Bar for hosting the event, as well as Bryan Mullins and the NWGA Music Hour on 95.7 The Ridge and Nelle Reagan on WRGA for promoting the event! So thanks a lot to all you kind hearted rock & rollers! See you out and about another time! The Northwest Georgia Music Hour is brought to you by Stephens’ Music Company and airs every Wednesday at noon on 95.7 The Ridge. This blog is a compendium to MullinsMania.com. 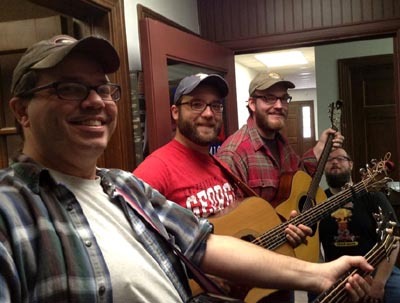 Andy Lester, Josh Brown, Manning Burns, and Adam Sikes of The Holler cram into the hallway at 95.7 The Ridge for an acoustic performance. Photo by Stu McFab. Posted in Uncategorized | Comments Off on Roots Rock Racks Up for Women of W.O.R.T.H. You are currently browsing the The Rumpus Compendium blog archives for January, 2015.